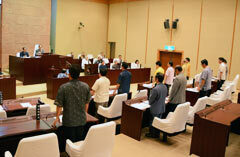 Kadena Town Assembly unanimously passed a protest resolution against the integration of Futenma Air Station to Kadena. May 17, Kadena Town Assembly Hall. The Kadena Town Assembly, chaired by Hiromi Tasaki, held an extraordinary session on May 17 to discuss the proposal by U.S. senator Carl Levin of the Senate Armed Services Committee and others that their government consider the option of integrating the facilities and functions currently at Futenma into those at Kadena. In the session, the Assembly unanimously adopted a statement of protest against the senators and sought the withdrawal of their proposal, insisting that the U.S. Marine Corps now based at the Futenma Air Station should be relocated out of Okinawa or completely out of Japan. Directly after the session finished, members of the Special Committee on Base Affairs conveyed the protest resolution to the U.S. Consulate General and the Japanese Ministry of Foreign Affairs Office in Okinawa. According to the chairman of the Committee, Kouei Tanaka, Consul General Raymond Greene stated that the suggestion to integrate the two bases comes from some of the members of the Senate, not from the government of the United States. He went on to say that the U.S. government considers that the plan to relocate to Henoko is the best option. Makoto Iyori, deputy director of the Foreign Ministry office in Okinawa echoed these sentiments, saying that the comments need to be seen as remarks by some members of the Senate, not by the U.S. government itself.